Find out the stories behind some of the greatest movie scores of the 1970s, featuring classic films such as Manhattan and its soundtrack of Gershwin compositions, or Nino Rota's The Godfather. 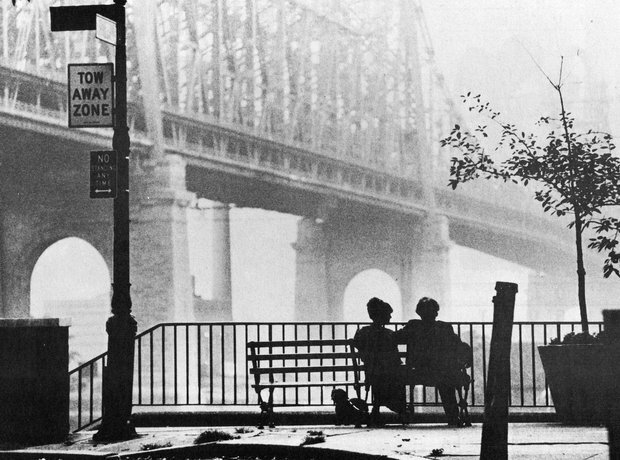 George Gershwin's Rhapsody in Blue has often been interpreted as a musical portrait of New York City, so it's perhaps no surprise that Woody Allen used the piece in his own love letter to the Big Apple, Manhattan. In fact the 1979 romantic comedy, starring Diane Keaton and Woody Allen himself, featured an entire soundtrack of Gershwin compositions. Not only did Francis Lai win an Academy Award and a Golden Globe for his work on A Love Story in 1970, but he also earned himself a place in the charts when the soundtrack album went to No. 2 in the Billboard album charts and the film's theme, "Where Do I Begin" became a hit single for traditional pop singer Andy Williams. Lai also successfully recorded the song bwith a full orchestra, and he went on to write the music for the 1978 Love Story sequel, Oliver's Story. The most famous piece of music to feature in this classic Vietnam war film from 1978 is Stanley Myers' classical guitar piece Cavatina. However despite become synonymous with the film and often referred to as the theme from The Deer Hunter, Cavatina was not written specifically for it. In fact the first time it appeared in a film was 8 years previously, when it was featured on a film called The Walking Stick. Originally written for piano before classical guitarist John Williams persuaded Myers to rearrange it, Cavatina has become a much loved entry in to the classical guitar repertoire, and one of the defining moments in 1970s film music. Nino Rota's score for Francis Ford Coppolla's gangster epic was removed at the last minute from the list of 1973 Academy Award nominees when it was discovered that Rota famous Love Theme used the same melody as one he'd used previously in Eduardo De Filippo's 1958 comedy Fortunella. Confusingly, Rota's score for The Godfather Part II went on to win the Oscar in 1974, even though it featured the same love theme that made the 1972 score ineligible! Right from the beginning of the Star Trek saga, the series' creator Gene Roddenberry wanted Jerry Goldsmith to compose the music. However Goldsmith was busy at the time so his first appointment came in the form of the first Star Trek movie in 1979. Inspired by John Williams' sweeping, romantic scores for Star Wars, Goldsmith wrote what many consider to be his best score, and would go on to write for Star Trek V: The Final Frontier, Star Trek: First Contact, Star Trek: Insurrection, and Star Trek: Nemesis, as well as the themes to the television series Star Trek: The Next Generation and Star Trek: Voyager. Composer John Addison won a BAFTA in 1977 for his score for A Bridge Too Far, an epic World War II film about a failed Allied attempt to break through German lines and seize several bridges in the occupied Netherlands. Despite boasting an all-star cast including Michael Cain, Sean Connery and Robert Redford, the film failed to turn many heads at the time, and Addison's BAFTA was one of the only honors a Bridge Too Far received. In Diamonds Are Forever, John Barry wrote what remains one of the most enduring of all James Bond songs, thanks partly to it still being a live favorite at Shirley Bassey concerts. Producer Harry Saltzman reportedly hated the song, and only the insistence of co-producer Cubby Broccoli kept it in the film. In 1976 John Barry was called upon to score John Guillermin's remake of the 1933 classic King Kong. Barry's score was very well received, even by those who didn't think much of the film itself, and although it was reduced significantly for the theatrical edition, the music was used to much bigger effect in the film's extended television version. Composer Richard Rodney Bennett had already had some success with his score for Nicholas and Alexandra in 1971, which earned him an Oscar nomination, when he began work on Murder on the Orient Express. His score for one of the truly great Poirot movies also got him a nomination at the Oscars and a win at the BAFTAs in 1974. In the same year that he received plaudits for his music for King Kong, John Barry also composed the score for Richard Lester's 1976 romantic adventure Robin and Marian. The film starred Sean Connery as Robin Hood, and marked Audrey Hepburn's return to the screen after an eight year absence. The moment the brass fanfare kicked in during Star Wars' opening title sequence, film music history was made. One of the most recognisable film scores of all time, John Williams heroic music for George Lucas' epic saga is credited as heralding the beginning of a revival of grand symphonic scores in the late 1970s. John Williams would go on to write the music for all six main Star Wars films, penning such classics as the Imperial March in The Empire Strikes Back, but it is the score for the very first Star Wars film however that would win John Williams the most awards of his career: an Academy Award, a Golden Globe, a BAFTA Award and a Grammy Award. Rarely does a piece of film music seem to so perfectly capture the film's atmosphere. In the case of Jaws (1975), John Williams would pull this off instantly. His score is widely considered one of the most iconic pieces of film music (it was ranked sixth greatest score by the American Film Institute) and is almost a character in itself. When Williams first played the main two-note motif to Spielberg on a piano, the director initially laughed thinking it was a joke. Williams described the theme, performed on the tuba, as "grinding away at you, just as a shark would do, instinctual, relentless, unstoppable." Hard to believe, but so prolific was John Williams in the 1970s that he was able to produce two timeless scores - Star Wars and Close Encounters of the Third Kind - in the same year. Spielberg's sci-fi classic was a rare example of director and composer working alongside each other, with Williams coming up with the famous five-note motif used in the film while the script was still being written. In complete contrast to the long process of Close Encounters of the Third Kind, John Williams score for Superman was one of the last aspects of the film to be added. Brought in to replace Jerry Goldsmith, who scored director Richard Donner's film The Omen two years earlier, Williams conducted the London Symphony Orchestra through a very entertaining score.